By 1902 they had begun manufacturing motorcycles with bought-in engines. 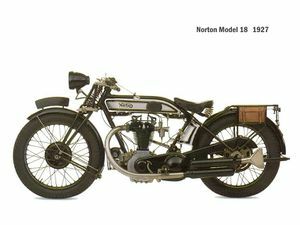 Norton's were considered 'behind the times', still using belt drive by the dawn of the First World War but improved their technology soon after with a clutch, gearbox and chain drive. 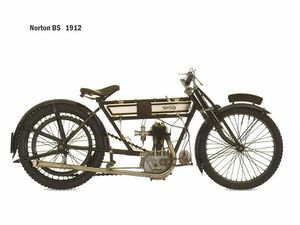 In 1908 a Norton built engine was added to the range. This began a long series of production of single cylinder motorcycles. They were one of the great names of the British motorcycle industry, producing machines which for decades dominated road racing with highly tuned single cylinder engines under the Race Shop supremo Joe Craig. Norton had considerable success in racing including taking nine places in the top fourteen in the first Manx TT in 1920 although none of those nine places garnered a win. Norton also boasted wins at Brooklands and many other races in Europe. Postwar a 500 cc twin cylinder model called the Norton Dominator or Model 7 was added to the range for 1949, and this evolved into the 1970s through 500 cc, to 600 cc, to 650 cc, to 750 cc and to 850 cc models with the Dominator, 650, Norton Atlas and Norton Commando 850, all highly regarded road motorcycles of their time. 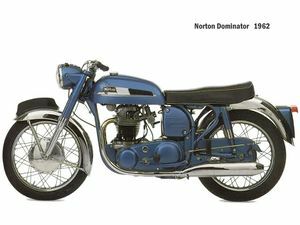 Norton had introduced their first parallel twin during 1949 with the introduction of the Model 7 Dominator 500cc. This was joined in 1952 by a "featherbed" framed version typed the Model 88 which utilised the same 500cc twin cylinder overhead valve engine housed in Norton's race proven chassis. Early models featured a deeply valanced sprung front mudguard which did little for the models looks and was replaced by an altogether more attractive blade type mudguard in 1953. For 1955 the twin gained an alloy cylinder head and adopted an Amal Monobloc carburettor and for 1956 the battery was enclosed and the instrument location was revised, however of more significance was the introduction of the Model 99 600cc twin. 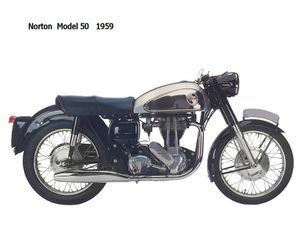 Demands for a Norton twin with increased performance had been growing following the introduction of the Triumph Thunderbird and Tiger 110 and the BSA A10 series machines which had left the Norton at a disadvantage. The new machine utilised the 88's cycle parts housing a revised engine with a swept volume of 596cc resulting from dimensions of 62 x 82 mm. Regarded by many as being one of the finest motorcycles of the decade, the 99 was endowed with the best handling in its class although it did not have the outright performance of the Triumph. 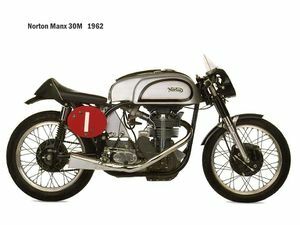 Norton was bought by motorcycle giant Associated Motor Cycles (AJS, Matchless, James and Francis-Barnett) in 1953 after it was evident that the company couldn't financially survive despite the success of the featherbed frame used in racing bikes as well as the Dominator in 1952. 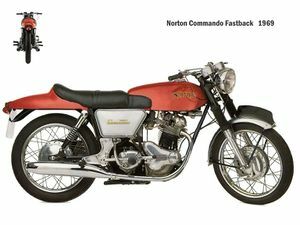 This take-over was not welcomed news to Norton aficionados. AMC went into receivership in 1966. 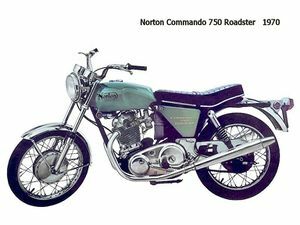 Norton was the only motorcycle marque in the company that made money at this point. The new owner called the reformed company Norton-Villiers. A few years would pass only to see financial trouble again. In 1973, the British government's attempt to rescue the motorcycle industry forced a merger of BSA/Triumph and Norton-Villiers in return for funds to remain in business. 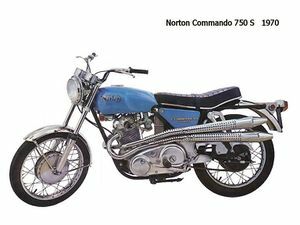 The resultant company was called was Norton-Villiers-Triumph (NVT). 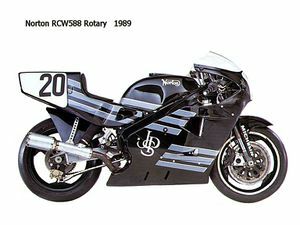 This incarnation of Norton liquidated in 1978 but the new owner kept building rotary engined motorcycles for the next 15 years with some success but few sales until the Norton name as we know it just slowly disappeared. In 1972, BSA was also in trouble. 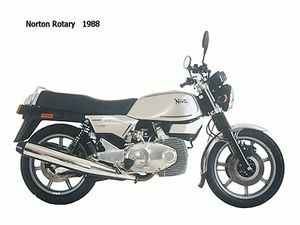 It was given government help on the condition that it merged with Norton-Villiers, and in 1973 the new Norton-Villiers-Triumph (NVT) was formed. The Triumph Motorcycles name came from BSA's Triumph subsidiary. Despite mounting losses, 1974 saw the release of the Norton 828 Roadster, Norton Mark 2 Hi Rider, Norton JPN Replica (John Player Norton) and Norton Mk.2a Interstate. In 1975 this was down to just two models, the Norton Mark 3 Interstate and the Norton Roadster, but then the Government asked for a repayment of its loan and refused export credits, further damaging the company's ability to sell abroad. Production of the two lone models still made was ended and supplies dwindled. This page was last edited on 21 January 2011, at 03:59.